This exhibition of nineteenth-century Victorian fashion represents a rare opportunity to showcase part of the Albany Institute’s costume collection, one of the museum’s treasures. Spanning more than 250 years, from the mid-eighteenth century to the present, the Albany Institute’s costume collection includes more than 4,000 garments and accessories that were used or worn by upstate New Yorkers of all ages, social classes, economic conditions, and cultural groups. From wedding gowns to walking suits, the garments features in this exhibition reflect the changes in styles during the reign of the British monarch, Queen Victoria (1837–1901). The Victorian era has received renewed public interest with the recent first season of the PBS television series Victoria. Over forty mannequins are dressed in clothing made of luxurious, vibrantly colored fabrics worn by residents of the Capital Region and beyond. This exhibition presents a selection of extraordinary outfits made by home seamstresses as well as professional dressmakers. Examples of complicated construction techniques are represented by gowns created by the Paris fashion houses of Emile Pingat, Charles Frederick Worth, A. Felix, Callot Soeurs, and others. Garments produced during this period reflect the wide-ranging impact of the Industrial Revolution on the aesthetics, technology, and social history of the time. 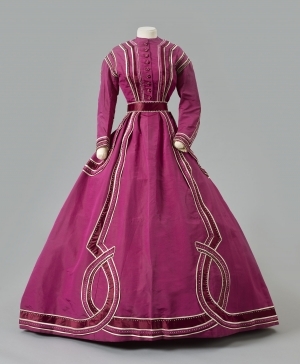 The featured costumes include examples of garments worn in daily life and for life’s special events; practical everyday styles are juxtaposed with garments of incredible beauty and design. The decade by decade changes in fashion will be illustrated by the array of silhouettes created with bustles and hoops and elaborate sleeves. The luxury associated with the Victorian era will be reflected in the jewel rich tones and sumptuous textures found in the fabrics: plaid taffetas, plush velvets, and shimmering silk satins.